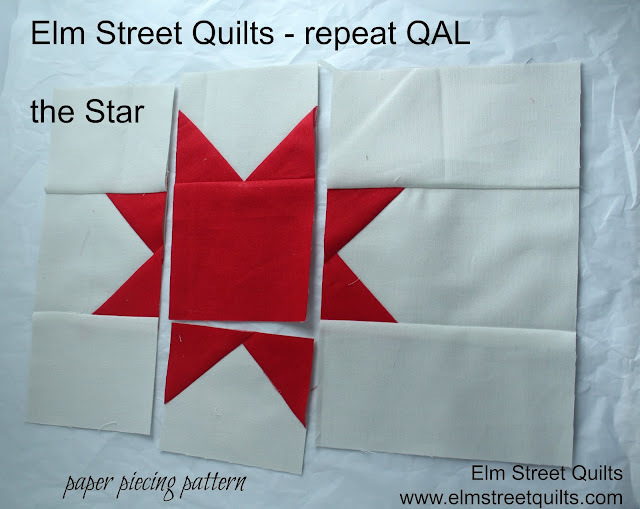 We are in the home stretch with the repeat QAL - time to make the star block and finish your quilt! All the letter blocks should be 5 ½ '' unfinished (5'' finished) tall in the quilt top. However, I know a few have had some issues with their printers. To help, the finishing instructions also contain directions on adjusting the filler blocks and the sashing to your actual block measurements. As long as your blocks are a consistent height, you are good! Next Monday (July 18th), the linky party will open. Looking forward to seeing your finished quilt tops - finished or unfinished. The linky party will be open forever but anyone who enters their quilt top through midnight Friday, August 5th will earn an entry into the giveaway. If you made more than one, you can earn entry for each quilt. More on that next week. Now, let's finish the quilt! The star block will be trimmed to 11 ½ x 8¾ ''. (Finished size will be 11 x 8 ¼ ''). For overall information on the QAL including any pattern updates, sponsor information and overall schedule, please visit the main repeat QAL page. Download a copy of the repeat QAL coloring sheet. Fabric requirement and suggested supply list are also available. Share progress photos in the Elm Street Quilts QAL Facebook group. Come cheer on others and make new friends. Don't use Facebook? Share your progress on Instagram. Make sure your tag the photo with@elmstreetquilts and use #ESQrepeatQAL as the social tag. Thank you Patty for this great pattern. Do you have any plans for putting out the other letters of the alphabet? Love this font!